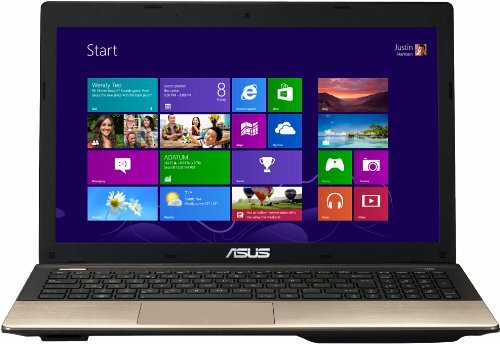 Below is our review of the Asus K55A, a 15.6" laptop, featuring 6GB RAM, 1TB hard drive and Windows 8. Upon opening the Asus K55A the first thing you'll notice is the beautiful brushed aluminium interior - a feature which makes this notebook look far more expensive than it actually is. A quick look at the specification and you'll soon realise that the K55A offers a lot of performance for it's relatively low price tag - Intel's Core i7 3610QM 2.4GHz Processor, 6GB of RAM, a generous and spacious 1TB hard drive, offering far more space than the average user will ever use. The hard drive operates at a speed of 5400rpm instead of the slightly faster 7200rpm, but in fairness we did not notice any problems in terms of access speed. The 15.6" display is LED-backlit - this TFT LCD screen offers a crisp resolution of 1366 pixels by 768 pixels, and was beautifully clear, and ideal for multitasking. Operating system duties are handled by the latest from Microsoft - Windows 8, which booted fast and was stable in use. In terms of connectivity, you are presented with the following options: Microphone in, headphone out, 2 USB 3.0 ports, 1 USB 2.0 port, VGA out, HDMI output, enabling you to display the laptop on a larger monitor or TV if required, as well as an Ethernet and DVD drive and card reader. All in all this should be more than ample for the majority of users. In terms of size, this notebook weighs just over 2.5kg, and measures 37.8cm by 25.1cm by 3.2cm - these are the maximum dimensions - and so fairly average for a laptop with a 15.6" display. As with most stock laptops, there was a fair amount of pre-installed software - some of which you may wish to get rid of - although this is fairly standard for any new laptop. The keyboard performed well, with decent spacing between the keys, which helps avoid typing errors, as well as a full size number pad situated towards the right hand edge of the laptop. This should please any users who require numerical input, such as spreadsheet users and those who need to code. Overall we really liked both the design and using this laptop - it handles multiple applications with ease thanks to it's high specification, and at it's current price offers very good value. Pros: Looks great, performs very well. Cons: Quite a lot of pre-installed software, some of which may not be of use to you. The Asus K55A offers great value at it's current price - well worth considering.